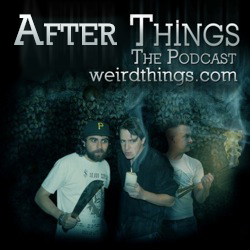 After Things is the official after show of Weird Things Podcast. Approaching and choosing new projects wisely. Andrew shares a book pick on the ingenuity of free elements and a discussion of free and freemium. Get After Things before anyone else by supporting Weird Things on Patreon! After Things has moved to its own RSS feed. Get the feed here or subscribe on iTunes here. A conflux of weird as Andrew visits a lava tube here on Earth. The boys also talk about that strange plume on Mars and a galactic visitor we had 70,000 years ago. How do our memories change over time? The boys come up with advice to make a name for Larry Paige. A message from a cultural icon from beyond the grave. This week: The boys talk to Chris Taylor about the writing process and his volunteer work at 826 Valencia. Brian’s use of a rival to motivate his own betterment. This week, Chris Taylor, author of “How Star Wars Conquered The Universe,” joins the boys to talk the past, present, and future of Star Wars, Lucas, and more! Follow Chris Taylor on Twitter @FutureBoy and find his book “How Star Wars Conquered The Universe” at HowStarWarsConquered.com. This week: Andrew and Brian talk about the appeal of the Super Bowl, the strengths of email lists, and how NOT to ask for a million dollars. A menace to society rears its head in the form of a 9 year old. A shark attack you won’t believe. An IPO that will make you and everyone you know filthy rich! You are currently browsing the Weird Things blog archives for February, 2015.